Denim – Don’t Just Wear It! Is it a painting? Is it a photograph? No. This is art. Denim art. And Ian Berry tells us how. Every item in this piece bears a striking resemblance to the original; from the chandelier and drapes, to the hearth and to the reflection of the window on the opposite mirror. 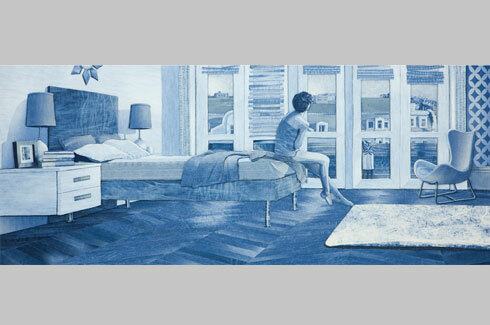 The woman in the centre is reflective of the mood of the piece – pensive, perhaps. 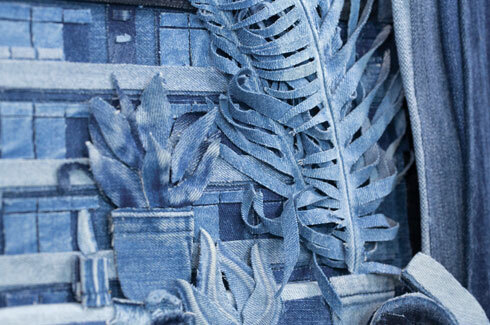 If we tell you wearing denim is not the only way to use denim, what would you say? Intrigued? 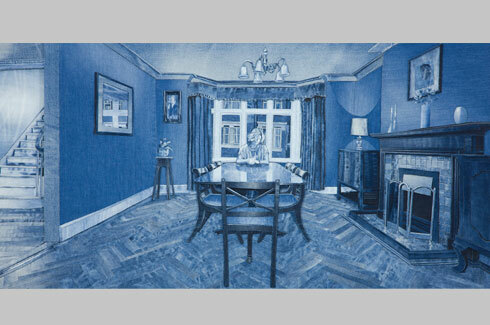 Well, we certainly were when we first got to know of Denimu’s Ian Berry who believes “denim is a reflection of the world in which we live.” When you look at Ian’s work, your first impression is that of an indigo coloured oil painting, or a photograph in blue. And for most, even when they’re at touching distance of his installations, it is hard to believe that the entire artwork is made from scratch and contains only scraps of denim in varying shades of blue. From his own admission, this series remains very close to Ian’s heart due to the overwhelming response he received. A typical scene in the laundry room of a building exquisitely recreated, detailing every single aspect. The most interesting feature is perhaps the flooring, made up of different swatches of denim, but with the final result made to look like floor tiles. Photorealism is a movement or genre that brings together various kinds of art form where the artist recreates an image or photograph (after close observation) as realistically as his skills enable him to. 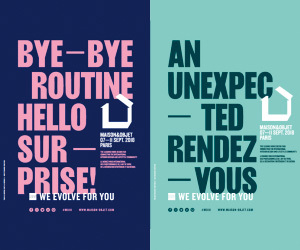 The movement became increasingly popular in the last century, and over the last couple of decades has seen tremendous change with digital machinery making it a near-precise art. Also part of ‘Behind Closed Doors’, this scene is left to the viewer’s imagination as one can draw so many stories from it. 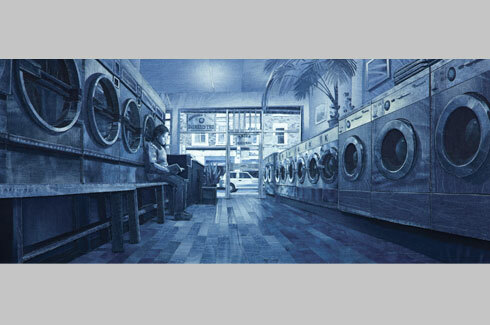 When asked where denim fits in with this movement, Ian says, “Many people think of my work as blue-toned photographs or paintings when they first come across them. 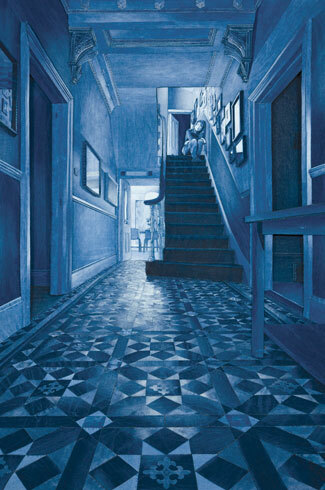 And that’s great, but sometimes you want them to come closer and have that ‘Aha!’ moment when they realise that what is in front of them is nothing but denim.” Ian maintains that because of the depth and numerous textures found in his works, likening it to photorealism wouldn’t be right. “My works are more like sculptures,” he says. In 2014, Ian unveiled his tribute to Brazilian racing driver and one of Formula One’s greatest – Ayrton Senna de Silva. The portrait was made from scraps of denim donated by Senna’s family. This was done to mark the 20th death anniversary of the Formula One legend. The money from the sale of the final portrait is said to have been donated to the Instituto Ayrton Senna in the hope to help improve the standards of education. 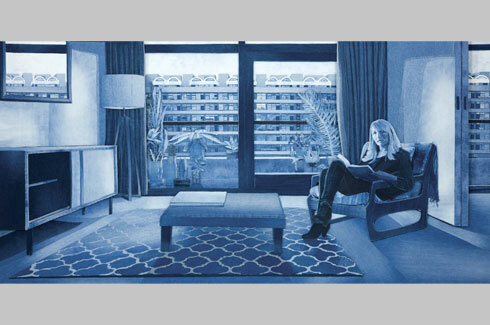 The rug in the front right hand corner is a wonderful reflection of Ian’s commitment to the art. What separates Ian from other artists is his ability to recreate metallic finishes in his works and his vociferous admission that he does not use Photoshop or any other software to enhance his art – “just my eye!” he signs off.